Discussion in 'Google TV News' started by JimMariner, Nov 15, 2010. The Google TV craze is just now getting started, and while Google is battling with NBC, ABC, CBS and FOX to enable users to view content via Google TV devices, other companies seems more than eager to do business with the search giant. Many companies are optimizing their apps and websites for use on Google TV; it's a great way to get users to experience something that they otherwise wouldn't bother to try. 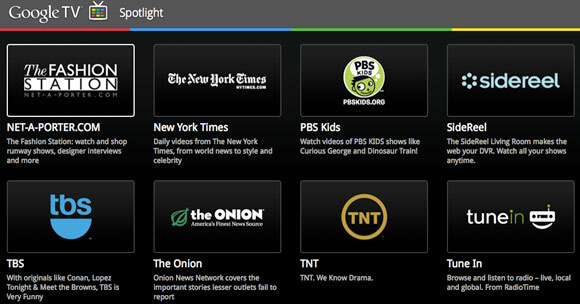 By getting into the Google TV spotlight, it enables Google TV users everywhere to hop in and get started with an app or content portal. And while Google TV is obviously focused on television, there are obviously other uses. Like radio! TuneIn Radio has already become extremely popular on Android and iOS, and now users looking to tune into their favorite stations online via Google TV (and leave running while dinner cooks, etc.) can do so. TuneIn Radio is now available through the Google TV spotlight, optimized for use on the platform and giving users the same features that they have come to expect from the mobile versions. It's free to use, and automatically displays a users local AM/FM stations, and provides links to search the entire directory by selections such as Music, Talk, and Sports, as well as an enormous library of podcasts. 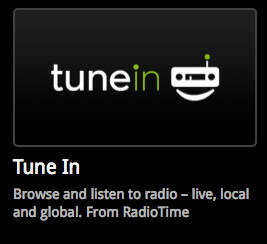 If you create a free account, users can link their presets to their Google TV accounts, and save and access presets on Google TV, RadioTime.com and the TuneIn Radio mobile apps. DALLAS--(BUSINESS WIRE)--RadioTime, Inc., a developer of technology for finding and listening to radio online, today announced its TuneIn Radio website optimized for viewing through Google TV, and featured in the Google TV Spotlight. TuneIn Radio features RadioTime's new Song Search technology, which allows users to quickly and easily search the directory of over 50,000 AM/FM and Internet-only radio stations for specific songs, artists, programs and stations. The TuneIn Radio home page automatically displays a users local AM/FM stations, and provides links to search the entire directory by selections such as Music, Talk, and Sports, as well as an enormous library of podcasts. Users can also search by a wide variety of parameters, such as program, station, genre, song title, artist name. I have this app on the Roku..it works a treat. I listen to several local fm radio stations that give me poor reception on my dipole, so the dipole came down!